Hong Kong, March 22, 2019 — Reolink today is excited to announce its cloud subscription plans, the release versions, are finally available! Reolink Cloud provides 4 subscription plans, including Basic Plan, Standard Plan, Premier Plan & Business Plan, and supports US, Canada, Australia & New Zealand. Reolink launches flexible cloud subscription plans to enable customers to enjoy an easy and secure video recording method. Please check the details of each cloud plan in the table below. 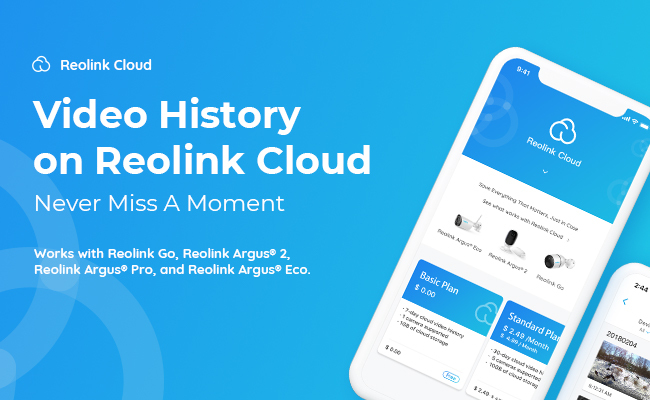 Reolink Cloud now supports Reolink Go, Argus 2, Argus Pro & Argus Eco. More products will be supported soon. Customers can follow Reolink Social Media to get the latest update. Reolink uses secure encryption to protect users’ data and keep customers’ information confidential. Reolink, a global innovator in smart home field, is always dedicated to delivering the easiest and most reliable security solutions for home & business. Reolink’s mission is to make security a seamless experience for customers with its groundbreaking security products. Reolink products are available and sold worldwide, providing video surveillance and protection for millions of homes and families. Please download the media kit here>> If you need any further details, please send an email to pr#reolink.com (replace # with @). This entry was posted in News and tagged Reolink Cloud Release Version.